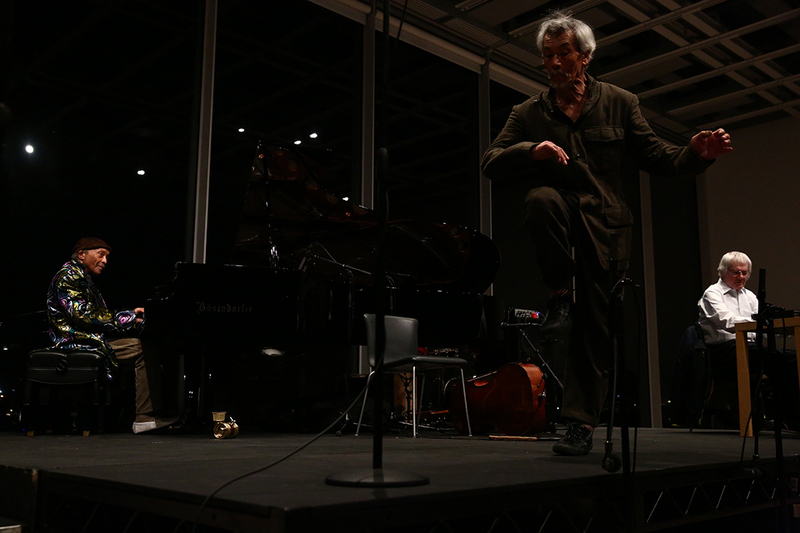 Cecil Taylor, Min Tanaka, and Tony Oxley in performance at the Whitney Museum of American Art, New York. April 14, 2016, as part of “Open Plan: Cecil Taylor.” Photo: Paula Court. Such, it seems, are the dubious writerly frames I devise when faced with an overabundance of choices. I should have Shick choreograph this column for me; Another Spell, which marked the twentieth anniversary of her first commission at Danspace, showed yet again how skilled this echt downtown choreographer is at placing incongruent moments next to each other and letting them float down the same gossamer stream. Echt downtown—what a weird thing to say in 2016. (I mean, my god, the Whitney just sent out a press release celebrating its “first anniversary downtown.”) But the crisscrossing lines of influence among artists like Shick, Susan Rethorst, Jodi Melnick, Jon Kinzel, and Juliette Mapp, many of them leading back in some way to Trisha Brown, still feel rooted in an aesthetic of time and place. It’s an aesthetic with which I’ve been intimately engaged as a watcher for the past decade; I was aware of that on Saturday night, at a full house in Saint Mark’s Church, having felt just the opposite at the Taylor concert. I don’t belong here, I haven’t earned this, I thought to myself several times during that sold-out, buzzy show—such as when an artist-friend in the audience (I only think jokingly) scolded me with “This is Cecil Taylor. You’d better put that notebook away.” Or when the audience roared at the entrance of the man—this is when art is like church, and you know when you’re not part of the congregation. Vicky Shick, Another Spell, 2016. 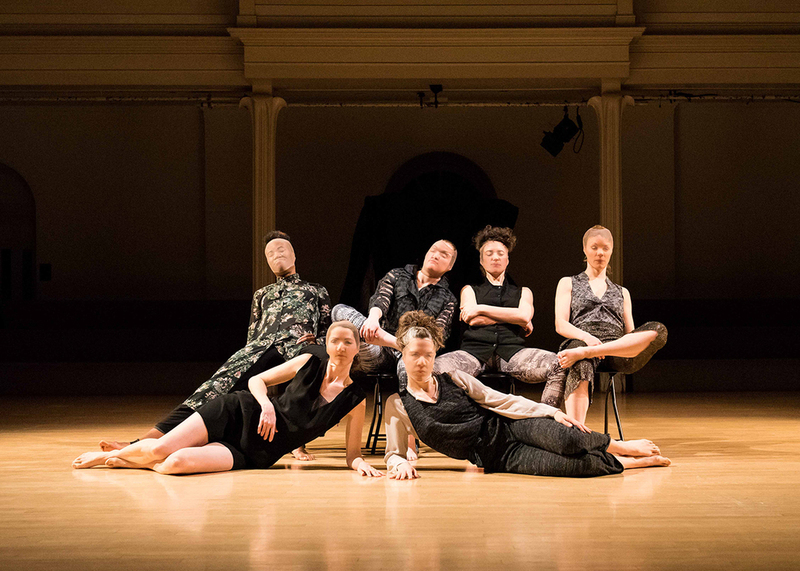 Performance view, Danspace Project, Saint Mark's Church, New York, April 12, 2016. Donna Costello, Heather Olson, Jodi Bender, Lily Gold, Marilyn Maywald-Yahel, and Vicky Shick. Photo: Ian Douglas/Courtesy of Danspace Project. The seven women in Another Spell come and go in restless eddies and bursts, going one way, going another. Finger snaps, forward rushes, the slow figure-eighting of pelvises and hips: eternity at the center of a wayward gravity. There wasn’t any shouting or whistling, as I recall, for Miami City Ballet’s performance—though there is a flow and speed and attack in this company that is easy to feel swept up in. One could imagine this was Justin Peck’s experience when he made Heatscape for them last year—though he seems perpetually swept up. In this ballet and in his new work for San Francisco Ballet, In the Countenance of Kings, he sends the dancers rushing to the lip of the stage, as if they would overflow its bounds and pool into the orchestra and beyond. He hasn’t yet sent them any further, I don’t think, but one holds out hope. Taylor’s intense charges and elusive breaks, it’s restlessness not, in the end, so unlike Shick’s feints of movement—but what Tanaka did with it, and with the dark, softly thick underlining of Oxley’s electronics, was something more akin to Petrushka on acid. The body never finds the right position. How can it when beset by delicate anvils? Taylor didn’t move very far at all, not once he had been helped to his piano. But his eyes tracked Tanaka everywhere, until the dancer curled down behind the musician, finally finding a core of stillness. Petrushka on acid isn’t really right—it’s a placeholder, something an outsider would say in trying to describe what was coursing around that night. After the sunset darkened the glorious view from the fifth-floor wall of windows overlooking the Hudson River, a reflection of the gallery space seemed to extend out into the night sky, like the belly of an alien ship. There was a second, impromptu act. There was more applause, the audience on its feet. “Open Plan: Cecil Taylor” ran April 15 through 24 at the Whitney Museum of American Art; Vicky Shick and dancer’s Another Spell ran April 14 through 16 at Danspace Project; Miami City Ballet ran April 13 through 17 at Lincoln Center.